We have migrated this blog over to it's own domain name, please go there now! This is a totally valid question, in the face of a lot of excellent literature, even on the sci-fi genre. Or take the classics, what could be better? First, undoubtedly Trek fiction is not the very best of fiction, ... some are barely passable of just readable literature. Very few have been bestsellers or been award nominees. Even so, they do sell well, and on any reasonably sized book shop there is a complete section just for the Star Trek books and novels. Why is this so appealing? I personally feel that one of the big attractions is easy to digest science fiction, with well-rounded, lovable characters which we already know well, and all the "rules", locations, enemies, etc., are also well known, so you can jump right in into the story without having to waste a lot of time in character building and universe exposition. You already know how all the gadgets work, that they have phasers, how they beam from one place to another using the transporter, and even how the ship operates using anti-matter channeled through dilithium crystals! But I'm guessing people want to get right away to strange science fiction conundrums, time travel paradoxes, strange alien customs and their repercussions, and all the mind-altering stuff that science fiction is known for. What I think the biggest appeal of the novels, is that it's expanding the known Trek universe, defining what happened between events you already knew happened. IT gives continuity between the big events, or explores the impact of those events. Roddenberry had a lot of vision of giving back story to Star Trek. Even on the FIRST pilot, the Enterprise crew were just recovering from a hostile encounter on Rigel VII, which was later expanded and fleshed out in a Comic. World War III was first referenced in "The Savage Curtain" and later shown in TNG and ENT episodes. It's fascinating to watch how they intertwine all these events into a believable cosmos. Diving into the novels is a great way to explore what more was added, and how it all works together. I'm still reading into the first novels, but it's really nice to see how the mythology is expanding, and how characters and events are added. Well, of course a lot of aliens and planets are introduced just one time and then forgotten, but still some writers are very savvy to integrate the better known into a immersive, multi-faceted quilt. 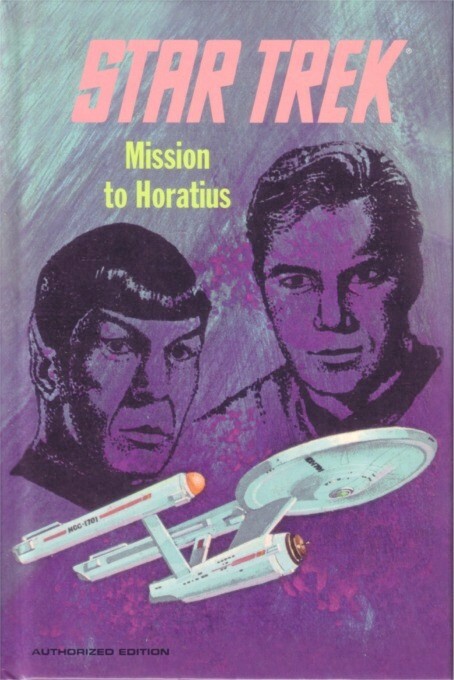 By word of Frederic Pohl, who edited the Bantam novels, "I didn't really pay much attention to Star Trek". But James Blish had noticed that the biggest checks he had ever gotten came from his previous Star Trek novels. They were starting to collect some fan stories, which would later appear as "The New Voyages" series of anthologies, but Blish started on writing original novels, even if Bantam and the editores did not think they were anything warranting much attention. Here, the Enterprise is sent ot monitor the Klingons, who was apparently seen breaking the "Organian" treaty. On trying to do some "experimental" use of the transporter, Spock is divided in two selves. This whole double self is not the same type that what was done in the "Evil Kirk" episode ("The Enemy Within"), but what I consider to be a very creative, and real good science fiction. 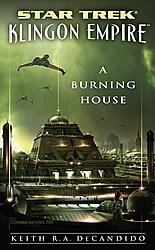 That's a breath of fresh air, as some other novels are just a bunch of tedious space opera. This part of the novel is actually quite enjoyable, where the crew tries to figure out the "mystery" of this double Spock. It laters does pick up some adventure/action scenes, and to be honest, I was fairly bored and did not pay a lot of attention, but basically the whole thing is that "a Spock must die". The Klingons are just there to be used as part of the scenery, and the novel breaks a big part of canon at the end (or at least, makes it impossible for a lot of other stuff to happen). This was readily ignored by every other writer. In fact, I think a big problems of the novels is that only the original author carries 'canon' between their novels: all others revert back to what was established by the TV episodes. I hope that later on, on more modern books, events are cross-pollinated between novels and authors; it would really enrich the Trek universe. The last action scenes and the resolution are a bit anti-climactic, but I think the whole explanation of what happens to Spock is really nice and very well done. Blish understands very well that personalities of the characters, and plays them well, even though some parts of the prose are a bit tedious he carries it off very well. There is an overly fascination with the Spock character, but this is only because of the attention people were giving to him. This novel is quite nice to read, and some of the best in the early writings. This style of writing is easy to digest, low on description, high on action and not very challenging, but it covers it's purpose: get a Star Trek novel out there with some good science fiction mixed in. I can easily recommend it, but I know there are a lot more that are much better. I'm still a bit undecided on how to approach all the fan-based productions out there, they do seem to be quite a bit. I'll leave it up to you if you would like to stick to "official" adventures, or expand out to fan fiction. 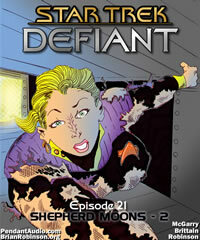 "Star Trek: Defiant" is a serialized audio adventure, released monthly. They just released their #21 episode, and they claim it's top ranked in the TV & FIlm podcasts in iTunes. It looks as a profesionally produced show, but I haven't listened to it. Maybe when I finish on the "official" stuff I'll give it a review. Novelizations suffer from some big problems, one of which is that it's very difficult to convey what has already been showed perfectly on screen. Video is a medium where characters attitudes, poise and responses say much more than what the dialog displays. Another problem is that as the scenes have already been established, writers tendo to just fall into what has been potrayed instead of imagining new or more exciting scenes. The attendant turned, and upended the pitcher. Three tribbles fell out of it. It was worse on shipboard. The corridors seemed to be crawling with the creatures. On the bridge, Kirk had to scoop three or four of them out of his chair before he could sit down. They were all over the consoles, on shelves, everywhere. Here we easily see it's really missing the whole frustration and desesperation felt by the Captain. And so goes on for the whole story, just duplicating the dialogue of the TV episode. It really misses a lot. By now, Blish had a notion of the popularity of the Star Trek scene, and was in fact impressed by the quantity of mail he had received for the previous books. He comments on this on the foreword. He now selects the best scripts, especially those with Hugo nominations. Fails to grasp most of the comedy of the video, but writes through the story acceptably. This one is fairly decent, but only because of the original scriptwriting; it is also very heavy on dialogue. An action packed episode, translates fairly well, but fails to capture the suspense and drama, especially with the constraints of pages. "We're about ready to bridge power from the warp en­gines to the beams. You've got to go to the main controls and free the board, so we can lock in. Give us ten clock minutes, then you and Lieutenant Uhura create your diversion, and run like Martian scopolamanders for the Transporter Room." "Right. Count down on the time. Five . . . four . . . three . .. two ... one ... hack." "Got you. Good luck, Captain." Originally a good episode, but here it reads more like a space opera. SPOCK: I'll—I'll follow you in a few minutes. In­struct Mr. Chekov to plot a course for the nearest base where I must—surrender myself to the authorities. . .T'­Pring. SPOCK: Why the challenge; why you chose my Cap­tain as your champion. T'PRING: Stonn wanted me. I wanted him. In general, the stories do not read that bad, but after a while you do seem rushed through like a grand european tour: see 7 cities in 2 days! There has been a distress call received from Horatius and the ship was sent to investigate. The mission was divided into investigating three planets, the first two of which were absolutely boring: the first still in the stone age (called "Neolithia", unimaginatively taken from the geologic age "Neolithic"). The second one, called Mythra (guess from which word it's derived), is a place of rampant religious beliefs; and the third planet is "Bavarya" (full of barbarians? ), tends to raid it's neighbors continously, is apparently the source of the problem. Oh, and the ship's crew is affected by a space sickness called "cafard" (in the long tradition of having the ship affected by a disease), so everyone is pressed for time. This might as well have been a western and a ship at sea, when writers focus more on the adventure than on the science fiction. It barely passes as an adventure tale, and it reads very shallow at points, like everybody is just doing their job dispassionately, as there is no big emotional involvement. It's nice to read a bit with familiar characters, looking into strange worlds, but it's executed badly. Also, rare on Star Trek books, there are line-drawn illustrations, which are very basic, like the minimum for a "young adult" novel. Reynolds does not seem to have put much of an effort, just toiling out another story for a then yet inexistent market. It really does not engage much the reader, although it does not lose you (a big problem on later novels). I would recommend it only to know the first original novel, but the "youngification" makes it lose a lot of it's appeal. Space opera had gone out of style, but this type of novels fall easily into it. There was a sharp hiss, and then the clear sound of the Gorn's claws, coming at a run up the gully. Kirk had mis-calculated. The creature was closer than he had thought--and faster. Frantically he struggled to align the clumsy bamboo tube. The Gorn leapt into view, its obsidian knife raised. Kirk slapped the burning piece of clothes against the touchhole, and the makeshift cannon went off with a splintering roar. The concussion knocked Kirk down; the semicave was filled with acrid smoke. He groped to his feet again. As the smoke cleared, he saw the Gorn, slumped against the other wall of the gully. The diamond egg had smashed its right shoulder; but it was bleeding from half a dozen other places too, where diamond chips had flown out of the cannon instead of igniting. Even so, the stories continue to be rushed, reduced to the simplest terms of the story, something that won't be fixed in any of the Blish novels. 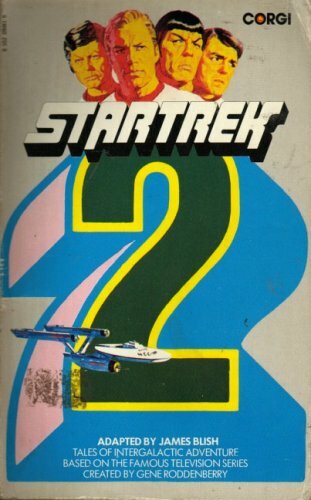 For a quick Star Trek fix, or to refresh what happened on the episodes, this novelizations might help. But a lot is lost in this novelizations. "It was a biped, a reptile, a lizard that walked like a man. It stood about six feet four, with tremendous musculature, dully gleaming skin, a ridge of hard plate running down its back, and a strong, thick tail. The tail did not look prehensile; rather, it seemed to be a balancing organ, suggesting that the creature could run very fast indeed if it wished. The head was equipped with two tiny earholes and a wide mouth full of sharp teeth." "Kirk fired. The key computer burst. A string of minor explosions seemed to run from it along the main computer bank-and then they were no longer minor. Hast-ily, Kirk herded everyone out into the corridor. They huddled against the wall, while the floor shook, and bil-lows of smoke surged out of the door of the Council room. It took a long time. At last, Kirk said, "Well--that's it"
And with that, Kirk solves a 500 year war. The whole beam down, hide from military action is suppressed... Finishes the story much faster and easier. It was on her advice that Kirk had retained Samuel T. Cogley, a spry old eccentric who put his trust not in computers, but in books. He did not inspire much confidence, though Kirk was convinced that Areel had meant well. Another dialogue heavy episode, most was transcripted, but I do not remember enough to tell how much. I think it sacrilege to take any other script other than Ellison's original... or let Harlan expand it to a full novel... This fails miserably to justify the scripts potential... let's just leave it at that. I'm sorry, I have Montalban's acting so deeply ingrained, I do not know what I'm reading here, but it's certainly a bare shadow of the episode. 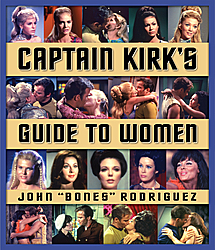 "Learn how to romance women all over the Galaxy with Kirk's Guide to Women." "Captain Kirk's Guide to Women is the first book to answer this question by probing deeply into Kirk's character, charisma, and seductive techniques, making it possible for any man to model himself after the Casanova of the Cosmos. It is also the only warp-powered romance manual written with enough wit, charm, and humor to help the female of the species make first contact." Looks as a spoof book, touching fun of Kirk's reputation. I guess it is a very light read, but no doubt a very enjoyable one. Here's another I.K.S. Gorkon Novel, tying deep into the characters of the Klingons. It starts with an intense action battle sequence, flows into a description of a transplanted limb, and drops into a typical Star Trek ship malfunction. The text then goes on to describe all types of political, personal, and ship-wide situations. In short, it's a action-descriptive style, with typical Trek sci-fi maquinations, with a Klingon flavor. Personally, I'm not that fond of Klingon stories, they tend to be a bit shallow, but this Gorkon novel seems to go much deeper than usual. A nice audio book of the successfull book by Vonda McIntyre, is nicely narrated by the previous character's actors. Takei takes quite some efforts to narrate, putting lot of emphasis on doing a lot of the voices, including Kirk's, Scotty's and even Spock's! Nimoy is not a big help here, he just narrates different parts, but does not bother's to do Spock's voice... quite weird. Nimoy sounds indifferent, but does not narrate lightly. For a review on the story, I'll post it later on a different post. On June 20 and 21, John de Lancie, and Robert Picard will host two concerts of music in Toronto's Roy Thomson Hall. The Toronto Symphony Orchestra will be playing select pieces from the movies and TV series. The event is called Star Trek: The Music and will be conducted by Erick Kunzel. Pieces include Alexander Courage's theme from the original TV series, Emmy Award-winner Jerry Goldsmith's opening theme for Star Trek: Voyager, the Klingon battle theme and the opening music from Star Trek: The Motion Picture. Oh man, it starts really with mediocre writing. Actually, it's quite not that bad, but only if you had not seen any of the TV episodes, or if you did not remember anything about the episodes written. There's no point in explaining the plot of these, so I won't even bother. This is the first ever Star Trek novel to be put into print. James Blish was chosen to write the scripts into these short stories, and it shows, as being crammed 7 of these into 136 pages will take out much of what was seen in the episode. As he was given the scripts way before the final episode was aired, there are some few, minor differences. Also, a novel is quite a different media than TV, so James takes some small liberties in describing the action. He takes a lot out, and leaves just enough to forward each story. The stories feel quite rushed, as jumping to one scene to another. If they were by themselves, with no aired episode, they would actually be quite great. But that's the problem of novelizations, it's a redundant effort. The cover looks 'sci-fi'enlish, but it seems it was obvious to display the faces of the major characters to attract sales. All in all, it seems a very half-hearted effort to cash in something of a very unknown at the time TV series. 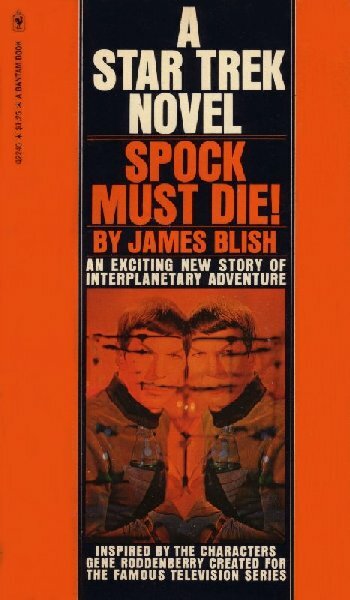 Later on, I'll post a complete linked list of the published Star Trek novels. Incredibly, most of these are available on the Internet! Well, it suffices to say I have acquired an almost complete collection of all the published novels, not counting the 'Young Adult' ones. Maybe later I will purchase them. But for now, I have quite a reading list! So, basing myself on the Star Trek Novel companion guide (Voyages of the Imagination), I ordered them by publishing dates and based my reading on that. There are various ways of attacking such a task. One would be to take it in internal chronological order; in fact, in the companion guide there's a very complete chronological order of each of the novels, and even on which chapters take place on which year. I pondered hard on doing it that way, even read some parts of them (Naturally, Q jumping back and forth and to billions of years back is quite interesting), but I finally decided it would be better to see how the mythos expanded since the series, and how much of it was integrated, absorbed and fed back to the TV series. In fact, David Yound is doing just this, reading them in chronological order. So a publishing chronological order seems best for this. This will avoid nasty spoilers, especially with all the time travelling (and there IS a lot in Star Trek). I have found it's quite effective, as the novels progress, stories start with very conservatively sci-fi elements, and become wilder as each author explores different parts of Trek. Some time ago, I discovered the huge wealth of Star Trek novels... At that time, I saw it was overwhelming, they were more than a 1000 novels! But the other day, I stumbled upon a speed reading course... and I thought it would be nice to practice with some fluff, pulp fiction stuff that should be easy reading.. so being a fan of the Star Trek TV series, it was only natural to pick up the novels for some leisure reading. It turned to be easier than I thought. A fast count right now comes up approximately 30 novels I have read so far. Some are actually not very good, so I did really speed-read through great chunks of them; but I got the gist of the novel. So now I guess would be a great way to start up a website, chronicling not just these novels, but also any other media I can get my hands on, including Comics, Audio books and Games. And as I'm currently keeping on top of Star Trek news, I'll post any relevant tidbits here. On the next post I'll detail my reading strategy.